Wellness? Check! NC State recently named BTEC a gold-level Well Wolfpack organization for supporting its faculty and staff in committing to a healthy lifestyle, and the State Health Plan deemed BTEC eligible for a diamond-level prize for its efforts in supporting worksite wellness. The university’s award program, in its second year, recognizes NC State organizations for their efforts in areas such as emotional wellness, active workplace initiatives, and fostering a culture of wellness. 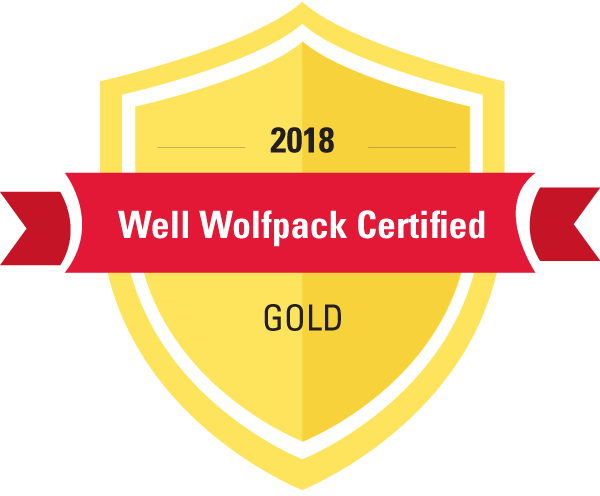 Criteria for the certification are based on NC State’s six elements of wellness: purpose, financial, emotional, physical, social and community. Points are awarded for each certification level (gold, silver or bronze). BTEC offered a number of wellness initiatives including several fitness challenges, and to recognize employees’ achievements, a day-long relaxation station will be provided at the facility in late September. The State Health Plan's rewards program enables employees to choose rewards from a variety of fitness-related items.